← “ALL HANDS ON DECK!” URGENT! On November 28th, I published my 75th blog post. I ended the post with a challenge to myself to post 75 blogs in the next 75 days. If you follow me, and read my blog regularly, than you have noticed that I haven’t been around these last few days. Fear not! This doesn’t mean I will not meet my goal of publishing 75 blogs in 75 days. This merely means there will be a few days I will be publishing more than one blog. Starting with today, I might just publish one, some days I might publish two, and if I’m really ambitious, I might even crank out three. Where have I been and why did I miss Saturday, Sunday, and Monday? I spent the weekend at the annual state convention of the National Federation of the Blind of Nevada. As I play the game of Musical Chairs, I have decided it was time for me to get back in the game and change negative misconceptions and low expectations about blindness. Stakes have been raised and rules have changed now that my daughter has been thrown into the court. You can bet your britches that this mom is NOT going to stand on the sidelines. I will be the loudest, the most competitive, and the strongest advocate to fight on behalf of my daughter’s rights and the rights of all blind children. During the convention, I met other parents and we are organizing the Nevada Organization of Parents of Blind Children. It is my hope for this organization to bring together parents, provide resources, connect blind shildren with positive blind role models, and creat and implement programs for blind children in our state. I fully intended on blogging via my WordPress ap on my iPhone, but the ap insisted it would rather crash on me. After the fourth attempt, I took it as a sign that I needed to turn off my phone, take a break, and take a nap. Sunday on Monday were spent catching up with housework, cuddles with the kiddos, and a lovely afternoon meandering through the Venetian playing catch up with one of my oldest and dearest friends. And here I am now, back in front of the computer with the kids tucked away in their beds. I will finish this delicious cup of tea, possibly start a second blog for the night, and start on the glass of wine that’s calling out my name. I’ve enjoyed catching up. I hope you have too. 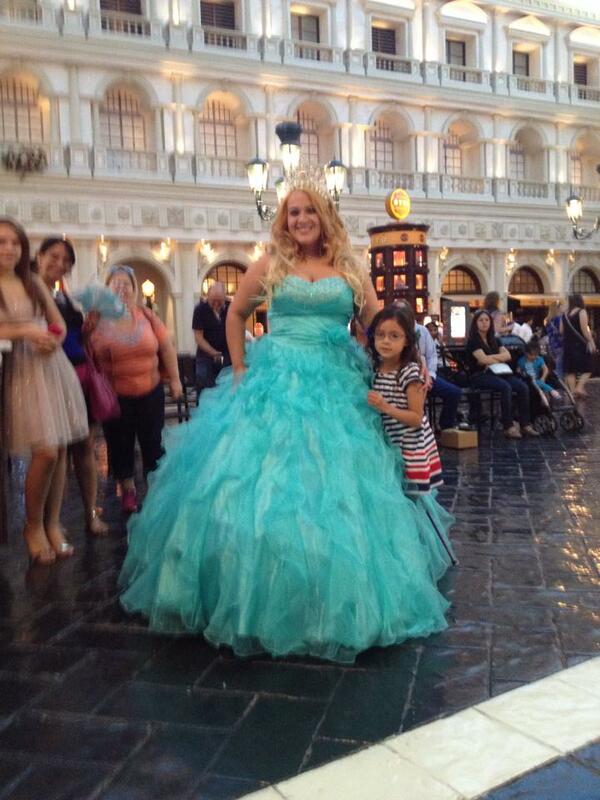 Marley followed this girl around thinking she was a princess. Suddenly out of nowhere, she worked up the courage and ran up and gave her princess a great big hug. 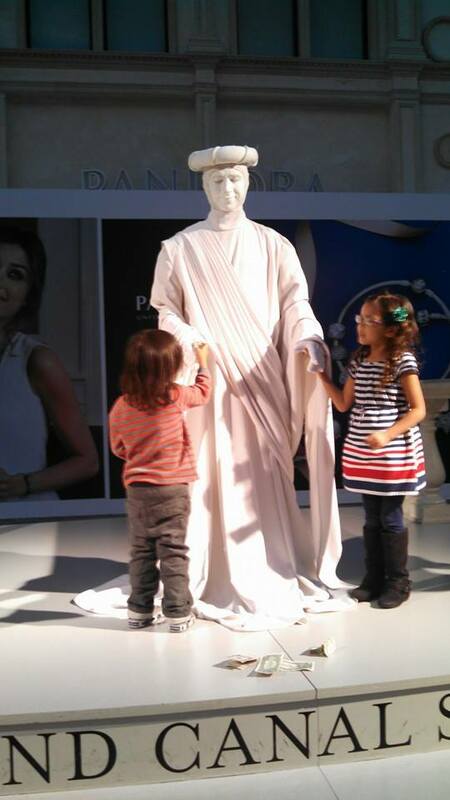 Jackson didn’t know what to think of this statue guy. He got more and more frustrated as he tried to give him a dollar. Posted on November 11, 2014 by MamaRupp	• This entry was posted in Uncategorized and tagged 75, Blind, blindness, blog, catch up, musical chairs, National Federation of the Blind, Nevada, organize, parents. Bookmark the permalink. Great update. You’re such a doer – jumping in with both feet to organize. Awesome. You may want to try deleting the app on your phone, going to wordpress.com on Safari, and just saving the dashboard to your home screen. Much more efficient that the app which can be temperamental.